This month's wish list happened to come together as an outfit and this really is the type of outfit I could live in. What's also great is that every single one of these pieces could also seamlessly work into other ensembles. 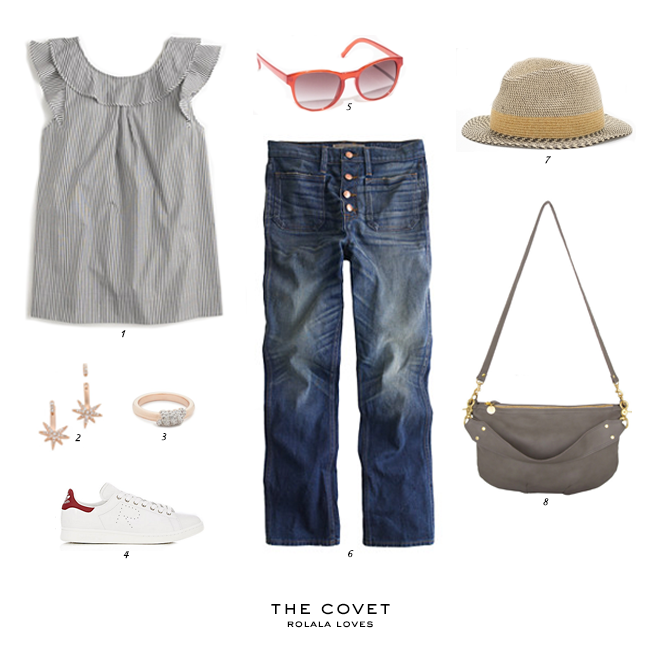 So what are you coveting lately? Love the ruffle top and the Claire V messenger bag! Lovely picks overall. 1. I love ruffles! they always add a touch of feminine appeal to any outfit. This top with ruffles is very cute. 2/3. Amazing ring and earrings....they would look great worn together! 5. This pair of sunnies is so lovely, perfect for Summer! 6. Those jeans are so cool and I bet they would be pretty easy to style. 7. Fedora hat is a must in Summer. 8. This bag looks so chic. The one that really caught my eyes is the messenger bag, it's very chic and I don't have anything like it too. Such a Cool set, Lovely top and jeans! Nice look!!! I love the hat!!! I love every single piece, Rowena. That top especially. If I had pierced ears all of my earrings would be ear climbers and ear jackets! Also, I want a pair of white sneakers as well. This all looks spot on together and I love 5th and Other Stories I was just in there Friday night. Lovely things! I love the bag and the sneakers. Love all of these picks especially the ruffle top. A cute piece for the summer or vacay!! I love straw fedoras for summer, but somehow don't have one at the moment. I need to get one before my beach holiday for protection. that top is TOO adorable for words!! The top is lovely, I bet it fits really nice! Love your picks! The Messenger bag looks like a nice staple piece. That is a cute outfit Rowena! I'm in love with the top especially. The cute flutter sleeves are precious. Love. Oh can I please have that top + those shoes?! So cute!! I can see why these products are on your list. Love the jeans and the top is so cute. Yes to the whole outfit and especially that sassy top:) Have a beautiful day, sweetie.